This article is about the Sarano tomb. 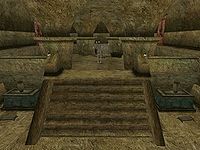 For Serano tomb, see Serano Ancestral Tomb. 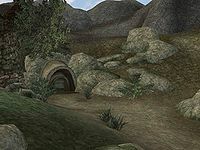 Sarano Ancestral Tomb is a large tomb, due north of the Fields of Kummu (via a north-northeast bit of road), in the Ascadian Isles region. You are sent here by the Fighters Guild to kill the hunger. 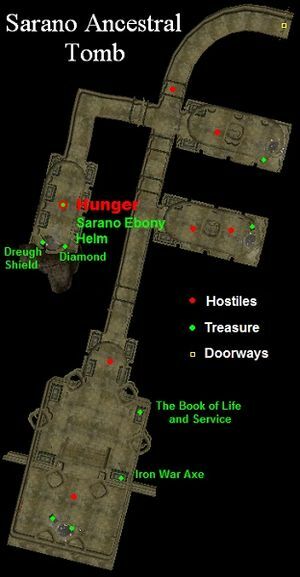 This unique hunger holds the Sarano Ebony Helm. 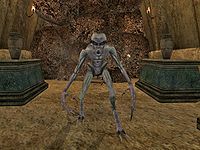 Inside, there are also six undead, a Dreugh Shield, some other minor equipment, the Book of Life and Service, quite a few ingredients (including a portion of Moon Sugar, Fire Salts, Daedra Skin and a Diamond found on the floor in the last room next the hunger), and two keys (to the chests in the far back of the tomb and to the locked door that the hunger is behind). The Hunger here is much weaker than standard Hungers and won't be hostile until provoked. It doesn't use magic and its melee attack and hit points are about 1/3 of the normal values. You'll still need a silver or better weapon to hit it though. This page was last modified on 25 October 2018, at 06:35.